Glowing orbs are a luminous spherical UFOs. They are also referred to as Nocturnal Lights and are classed as NL/CE-1, NL/CE-2 or NL/CE-3 in the Hynek/Vallee Classification Sysyem. They are not to be confused with the more ethereal psychic orbs that are sometimes seen on photographs and that often turn out to be nothing more than camera artifacts. Glowing orbs are generally no larger than a few feet across and unlike ball lightning, plasma discharges, or earth lights, sightings of orbs indicate intelligence and control. For this reason they are usually presumed to be a type of probe or shuttle, probably dispatched from a larger craft called a mother ship. 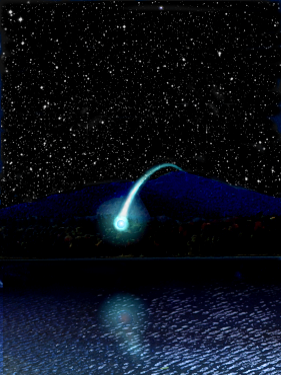 Sometimes a spherical structure can be seen within the glow, but usually the orbs are seen from a distance and do not seem to have any solid structure. Some ufologists have speculated that glowing orbs may be highly evolved entities, or perhaps even multiple entities. The plausibility for such beings is based largely on the emerging field of nanotechnology, in which futurists like Ray Kurzweil foresee the day when computers become both super-intelligent and very small. Such entities may be able to design and integrate super-technology like anti-gravity propulsion and advanced communication into their core makeup. They could then travel as a group over vast distances and use the materials and energy freely available in space to produce power and maintain themselves. As a collective, they would also have the ability to separate and rejoin, thus explaining sightings where single objects seem to divide or multiple objects seem to merge into one.